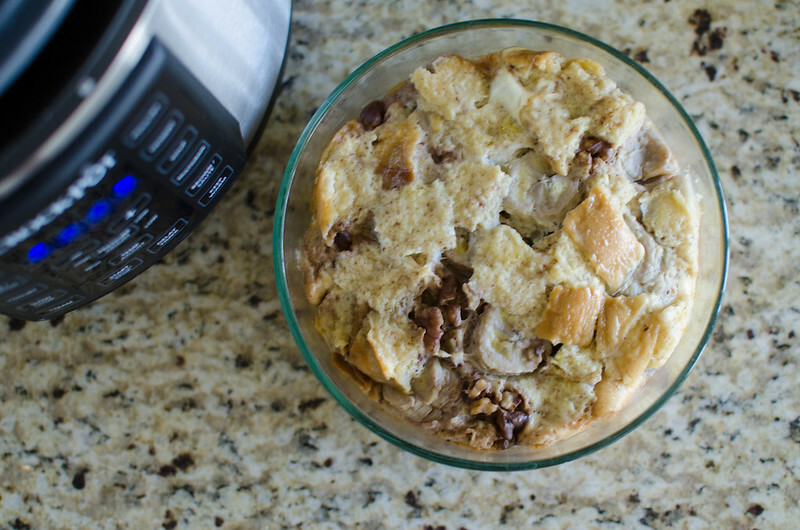 I’m using my Crock-Pot Express Crock Multi-Cooker again for this post! And for pretty much everything I cook these days. 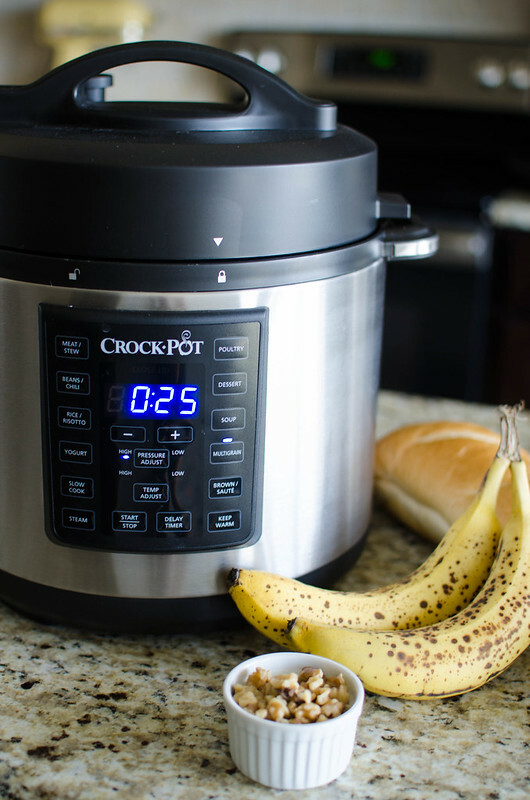 It combines the functions of pressure cooker, slow cooker, steamer, sauté/browning, and it has 8 preset buttons that cook a variety of meals. Like, it has a button for steaming, a button for poultry, one for soup, and so on. It makes dinner really easy and you’ll be able to get it on the table 70% faster! The Crock-Pot Express Crock Multi-Cooker is also available in 4-Quart and 8-Quart models, so it can accommodate any family size! Also, the Express Crock means less dishes since you can sauté your onions or whatever and then toss in the recipes of the ingredients to pressure cook or slow cook. For this recipe, I used the steamer basket which has turned into one off my favorite ways to use the Express Crock. I think I steamed whole sweet potatoes 4 days last week. In 15 minutes, I had perfectly cooked sweet potatoes. So it’s great for meal prep if you’re that kind of person. Anyway, like I said, I used the steamer basket for this one. 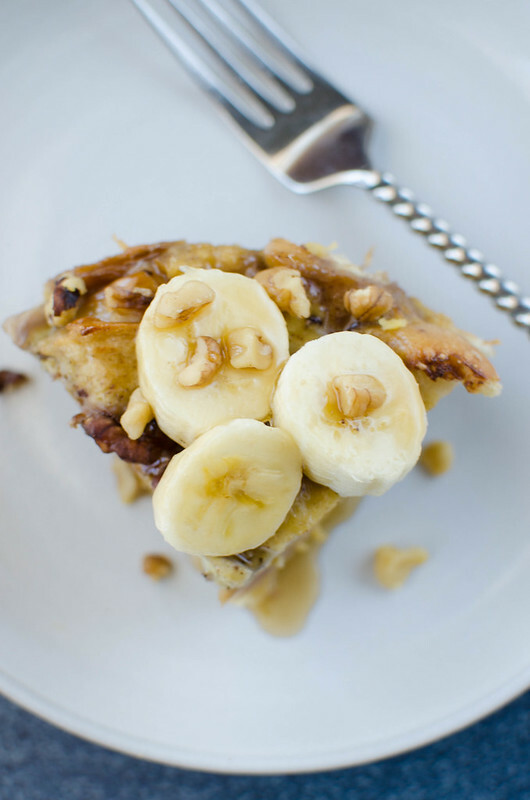 But what I did was assemble the Pressure Cooker Banana Walnut French Toast in a glass bowl (mine was 1.75 quart) and then placed it on the steamer basket in the Express Crock. And then it cooks in 30 minutes. You can make it the night before for an easy breakfast or you can assemble it right before you’re going to cook. It actually doesn’t take that long to put together. 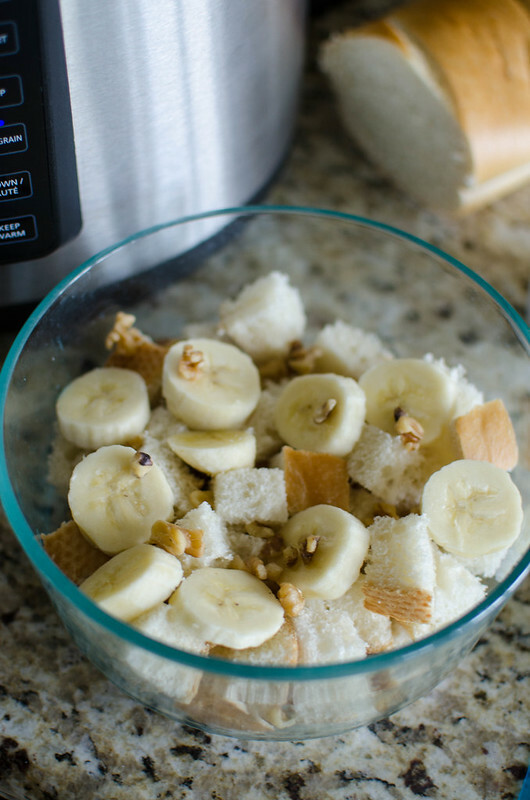 It’s just cubed French bread, sliced bananas, and walnuts layered in the bowl. A mixture of egg, milk, vanilla, cinnamon is poured over top and then you just make sure everything is covered. Spray a glass bowl (I used a 1.75 quart) with spray oil. In a bowl, whisk together eggs, milk, maple syrup, vanilla, and salt. Set aside. Spread 2 cups of the cubed French bread on bottom of glass bowl. 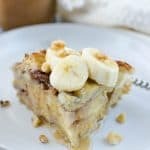 Top with half the banana and half the walnuts. Layer 2 more cups of French bread and the rest of the banana and walnuts. Top with the rest of the bread. 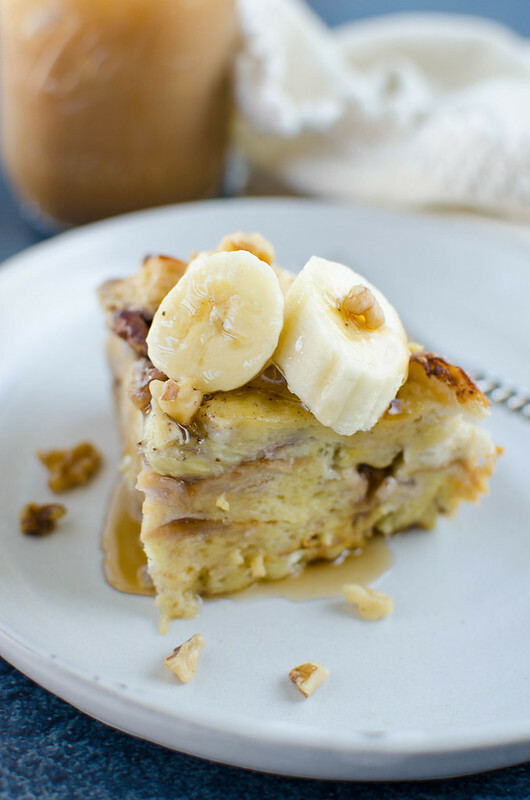 Pour the egg mixture over the French toast and press the bread down to make sure everything is covered. At this point, you can cover it and let it sit in the fridge overnight if you are prepping it ahead. Or you can go ahead and cook now. Place steamer basket in the Express Crock. Carefully place French toast on top of the steamer basket. Close and lock lid and make sure steam valve is closed. Press “Dessert” and increase the time to 30 minutes and the pressure to high. Press “Start/Stop”. When the timer goes off, press “Start/Stop” again. Do a quick steam release by using a utensil to flip the steam valve to open. Using something to protect from the heat, remove the French toast from the Express Crock. If you want a crispy top, put it under the broiler of your oven for just a minute or 2. 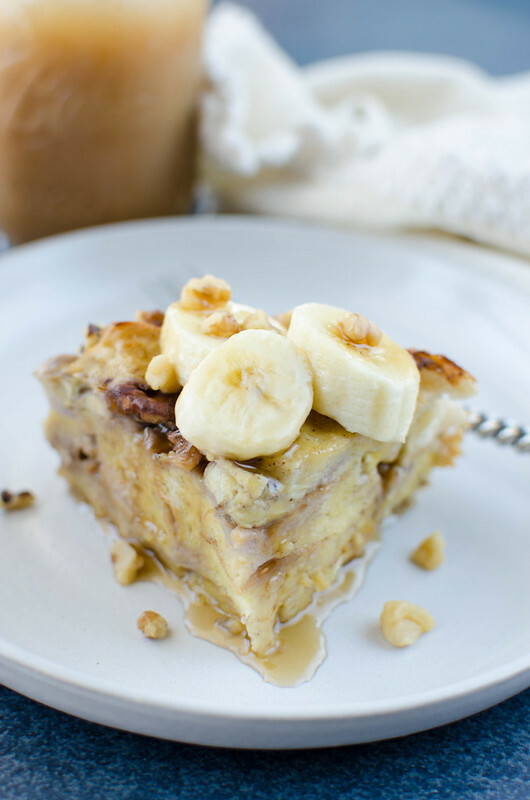 Top with fresh banana slices, walnuts, and maple syrup.